Last year saw the stunning announcement of synthetic bacteria. Now the next step has been taken, a move towards a synthetic organism that's markedly more complex — yeast. We're not quite at the point where we have an entirely synthetic yeast, but Jef Boeke of the Johns Hopkins University School of Medicine is getting there in a way that would suit Bladerunner's replicants: he's building it one piece at a time. Yeast has 16 chromosomes that will need to be replaced with synthetic variants before we've cast off nature's shackles. Boeke has replaced the the right arm of chromosome 9 and part of the left arm of chromosome 6, and over the next five years plans on sequencing and replacing the rest. He began by designing the new sequences on a computer, using the known sequence as his starting point. He stripped from this virtual DNA all the meaningless "junk" DNA, which does not code for proteins. Then he added markers called loxPsym at the ends of all non-essential genes – those that could be changed or deleted without killing the yeast. In the real world, these markers can be attacked by an enzyme called Cre, which swaps genes between the marker sites. 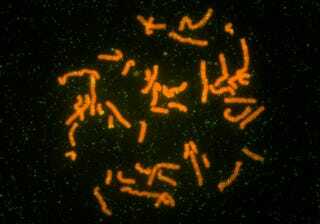 Finally, he created these new sequences in the lab using the chemical building blocks of DNA, and inserted them into a living yeast in place of its natural chromosome arms. Once the entire yeast is synthesized, scientists will be able to use Cre to shuffle non-essential genes around and make wholesale changes to the genetic code. In essence, they'll induce controlled mutations and customized evolution. Does this make any beer brewed with the new yeast Synthehol?